Join us on a coach tour to visit the highlights and the best places to see on Kefalonia, giving you an excellent opportunity to get a taste of what our beautiful island has to offer. Pay your respects to the island’s patron saint and enjoy a spot of wine-tasting. Visit the magical underground lake of Melissani and the breathtaking cave of Drogarati. 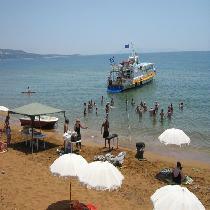 Beach Barbecue - All aboard Captain Makis glass bottomed boat for a fun-packed day in the sun! 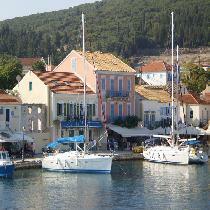 Spot fish and other sea creatures as we cruise Kefalonia’s stunning coastline. Enjoy snorkeling, beach volley and other games whilst soaking up the sun or simply relax on the beach. Savour the delicious barbecue lunch prepared by the captain and his crew. Join in the karaoke and dolphin-spotting. 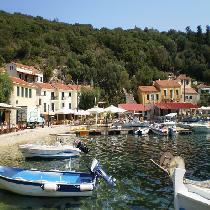 Venetian Voyage - Visit the picturesque village of Fiskardo at the northern tip of Kefalonia. Enjoy spectacular scenery as we cruise along Kefalonia's coastline, with a swim stop at the beautiful bay of Polis on our sister island Ithaka before relaxing in Fiskardo. Kick your weekend off in style with a trip to our island's cosmopolitan capital. Head to Argostoli for the chance to browse the local shops and boutiques,enjoy a fabulous evening meal and finish off with coffee or cocktails in the bustling main town square. An excellent opportunity for those staying in the resorts of Sami and Agia Efimia to get a taste of what our beautiful island has to offer. Delve into the depths of Drogarati cave, pay your respects to the island’s patron saint and enjoy a spot of wine-tasting. Ascend to the old capital of the island, the remains of the fortress of St George and on to the present day capital of Argostoli for shopping and lunch. 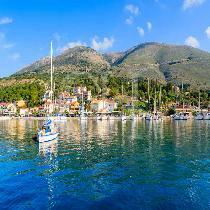 Ithaka Cruise - Enjoy a day of myth and magic as we cruise around Kefalonia’s sister island of Ithaka, taking in the beautiful views whilst hearing the story of Odysseus. 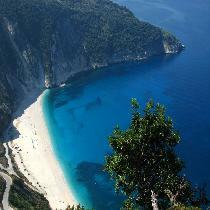 Enjoy a refreshing swim stop at the stunning Gidaki Beach. 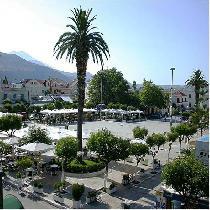 Time for shopping or coffee in Vathi, the capital of Ithaka.